I couldn’t resist adding in Colin Firth in the famous Mr. Darcy lake scene. It might not have been in the book, but I doubt even Jane Austen would have had a problem with this addition. This entry was posted in Wordless Wednesdays and tagged books, Colin Firth, Jane Austen, Mr. Darcy, Pride and Prejudice by Alison Doherty. Bookmark the permalink. 1. I LOVE the elephant teapots on your shelf! They are teapots, right? I hope I’m not making an idiot of myself, lol. I love elephants. 2. I love these memes! Darcy’s such a grumpy lump for a great chunk of the story that he deserves to get hipster meme’d. To be honest, I have really mixed feelings about Darcy – like that whole “Yeah he’s the hot brooding guy but really I’d just love to verbally slap him silly” problem. But when it comes to the movie, no question, Colin Firth is smokin’ and all reservations about Darcy melt in front of his hotness! Thanks so much for visiting/reading/commenting. The elephants are teapots! Totally understand mixed feelings about Darcy. When I think about it intellectually her seems kind of boring and broody … but I guess the heart wants what the heart wants. All of those cause me to giggle. The Colin Firth version is still my favorite version of Pride and Prejudice. “She is tolerable I suppose.” Who can resist that line or the lake scene??? Love the lake scene!!! Definitely agree with you about the Colin Firth version being the best (not only because it’s the longest). Also definitely agree with you about the lake scene – obviously. I think this is my third time posting it somewhere on the blog. The lake scene is too much for me! (In a good way) Thanks for checking out my blog! Thanks for commenting and joining my mutual appreciation club of the Colin Firth lake scene. Oh my goodness…that is kind of creepy. 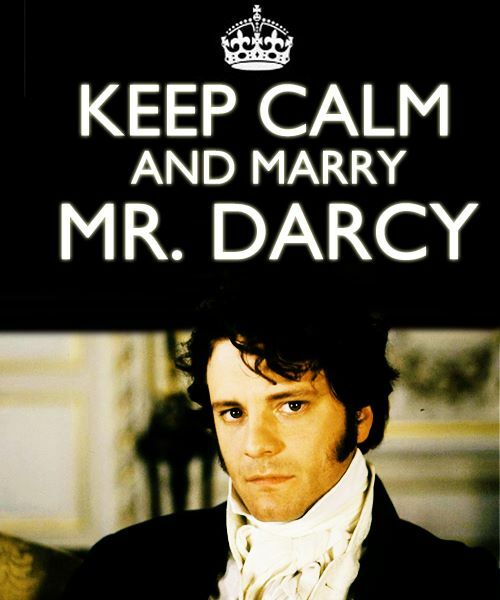 I’m glad to see there are bigger Mr. Darcy fans than me out there!